In a first for mission control and a shuttle crew, the Discovery astronauts were awakened Tuesday with a live performance of "Blue Sky" by Big Head Todd and the Monsters, a tune inspired by the first post-Columbia mission. The song won the most votes in a NASA "Top 40" competition giving the public an opportunity to select the crew's wakeup music. Playing an acoustic guitar, band leader Todd Park Mohr, singing solo but flanked by his three fellow musicians, serenaded the astronauts at 3:23 a.m. EST (GMT-5) to kick start Discovery's final full day in space. "We've waited long for this day to come," he sang, "for all the midnight lights we've burned into the morning sun, I can't wait to see your sweet mysteries, the moon, the stars, the sun, the universe, the galaxies. "Fly home on your silver wings, with your new song for the world to sing, light this candle, make it right." Big Head Todd and the Monsters won a NASA competition allowing the public to pick two of the Discovery crew's wakeup songs, winning 722,662 of the more than 2.4 million votes cast. Second place went to the theme from the "Star Trek" television series, which was beamed up to the crew Monday with a voice over by William Shatner marking Discovery's final mission. "Hello everybody. Greetings, this is Todd from Big Head Todd and the Monsters," Mohr radioed Discovery from mission control. "Well, good morning, Todd, thanks very much for that," commander Steven Lindsey replied from orbit. "That was great. Did you just do that live?" "I did just do that iive, and I believe it's a first in history." "Well, that was terrific, we really appreciate it and congratulations on winning the contest," Lindsey said. "Well, on behalf of Big Head Todd and the Monsters and songwriters and artists everywhere, we just want to thank you so much for your courage and your bravery and your effort in just giving all of us a better shot at knowing more. It's very inspirational to the arts as well. I just want you to be home safely and as soon as you can." "Thank you very much," Lindsey said. "We all wish you could see what we can see when we look out at the Earth and hopefully, everybody will be able to do that one of these days. Hopefully sooner rather than later." "We'll work on that together. Thank you so much." Lindsey and his crewmates -- pilot Eric Boe, entry flight engineer Nicole Stott, Michael Barratt and spacewalkers Stephen Bowen and Alvin Drew -- planned to test the shuttle's re-entry systems early Tuesday and rig the ship for re-entry and landing Wednesday back at the Kennedy Space Center to close out the shuttle's 39th and final mission. Forecasters are predicting generally good, if windy, conditions at the Florida spaceport Wednesday, with rain and thunderstorms expected Thursday. Good weather is expected both days at Edwards Air Force Base, Calif., and conditions should improve in Florida by Friday. CBS News, ABC News and The Associated Press will interview the astronauts starting at 11:23 a.m., followed by a crew tribute to Discovery at 12:08 p.m. A Mission Management Team update on the health of Discovery's heat shield is planned for 12:30 p.m. and a briefing with entry Flight Director Tony Ceccacci is on tap at 2 p.m. Discovery is scheduled to end its final mission with a touchdown on runway 15 at 11:57 a.m. Wednesday. The crew of the next shuttle mission -- commander Mark Kelly, pilot Gregory H. Johnson, Michael Fincke, Gregory Chamitoff, Andrew Feustel and Roberto Vittori -- will be on hand later in the day to watch the shuttle Endeavour's final roll out to pad 39A for work to ready the ship for launch April 19. The Discovery crew will participate in a final news conference around 6:30 p.m. Wednesday. 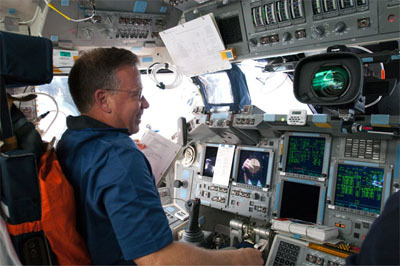 Kelly and his crewmates plan to field questions shortly after Endeavour's rollout gets underway.